Weber is well established as a premier builder of mandolins. Weber Mandolins are built in Bend, Oregon, having recently relocated after many years in western Montana. 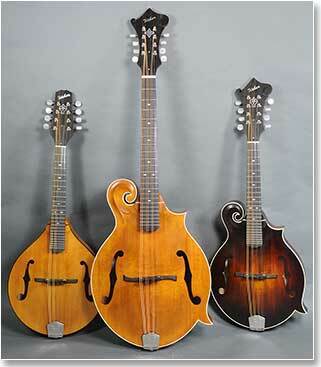 Models include carved A and F styles in Mandolin, Mandola, Octave Mandolin and Mandocello. All instruments are built with the highest level of workmanship in construction detail and design. Many of the Weber mandolins we stock have custom finishes or other upgrades. Typical options include Sitka or Red Spruce tops, satin or gloss finishes, custom colors and wide nuts. Spruce Tree Music is proud to be a Weber Specialty Dealer, representing the finest instruments Weber has to offer. Also check our selection of Used & Vintage Mandolins, which sometimes includes Weber instruments.